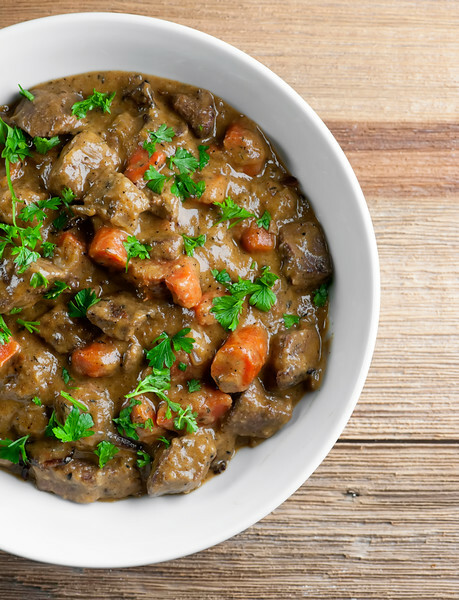 This recipe for creamy mustard beef stew will warm you up on those chilly nights! It’s the classic supper favorite with an extra zing of flavor. 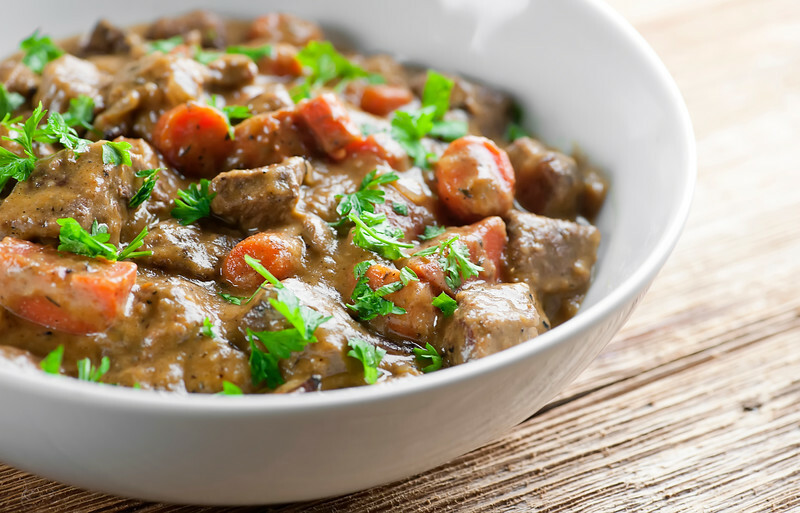 Oh, this creamy, dreamy mustard beef stew! It’s scrumptiously hearty with a thick creamy sauce, filled with tender chunks of beef and carrot, pieces of bacon, and just a hint of zesty mustard to give the whole thing a nice little zing. It’s warm. It’s wonderful. It’s going to make your weekend all kinds of delicious…let’s make it!I don’t know about you, but I do love it when the weekends turn just a little bit chilly. Because chilly weekends mean Clemson football…although I have to say that I am continuing to get grief about my choice of orange clothing on Game Day. 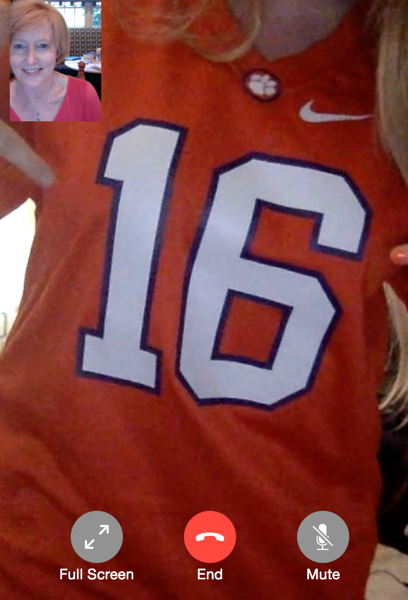 That’s me in the top right, and the Southern daughter wearing her lucky Clemson jersey while simultaneously challenging me on whether my shirt is actually orange. I say orange is in the eye of the beholder. I also love a nice glass of wine on a Sunday afternoon while I am cooking delectable beef stews. It feels all kind of decadent to have a little pinot noir while it is still light out. And we deserve a little decadence now and then, am I right? Meanwhile back at the stew…for something that is as creamy and dreamy as this stew, it has just the teeniest bit of cream in it. Two tablespoons in the whole glorious pot, which is just enough to give the sauce that silky texture. The rest of it is a conglomeration of simmered beef and carrots and shallots and BACON, all finished off with a swirl of that cream and just enough mustard to give it a little sass. So go Tigers, hurray for red wine, and bring on the beef stew…life is good! Cook bacon over medium high heat in a Dutch oven or other heavy pot. Scoop out and drain on paper towels, leaving the drippings in the pot. Shake beef in a plastic bag with flour, a pinch of salt and a pinch of pepper. Add to pot and cook over medium high heat until browned. Add shallots, carrots and tomato paste and stir. Pour in broth and simmer for 90 minutes. Stir in cooked bacon, mustard and cream. Serve with a scattering of parsley. I have to say I have only made broth-based stews, without any creamy elements, but this does sound good too. I can imagine that it enriches the dish even more. I guess the chillier weather made us both think stew this weekend Kate! And football! I love the addition of the Dijon and the cream in your recipe. I’ll need to try it next time. Hope you have a great week. Oh this is my kind of stew! Thick and hearty and loaded with yumminess. I’ve never added mustard in before! Such a great idea, Kate! Sounds so delicious, especially with that bacon. 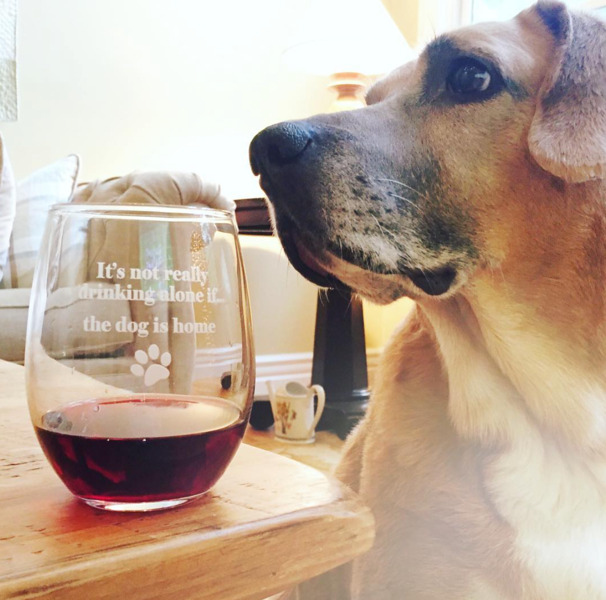 And I love your wine glass, too! I love dijon flavor in my beef stew. This looks perfect since the weather here has turned super cold. I agree it’s not drinking alone when your dog is with you! Too cute! Love that wine glass!! I also love food like this when the weather gets colder. Well, to be honest, I love food like this ALL the time, but especially when it’s chilly out. That’s a big bowl of comfort. So many delicious flavours….and how can you go wrong with bacon :) ? This dish is so my kind of meal. Hearty and warm! looking great! Here’s a great hack for people who don’t want to buy a whole container of cream. Go to your local Dunkin Donuts and order a coffee with cream on the side. They will give you a few containers of the half and half, and I actually measured it out and 3 of those packs equals 2 tablespoons. You heard it here first!! when i think of a life without mustard, i get sad–i LOVE that stuff. this sounds extra delicious, kate! This is the kind of hearty stew I crave in the fall and winter. Just give me a chunk of crusty bread and I’m good to go! Fall is definitely stew weather! My family loves stew and I love cooking up a huge pot for dinner. I will need to try your version…love that you’ve added mustard! Haha… How I love a sassy stew, Kate! This looks absolutely amazing and the flavors sound so delicious. Pinning for sure, I really need to try this one!! I found your site completely randomly while searching for new/different stew ideas. This fit the bill.perfectly different enough for me, but not too different for the family. I did add about a pound of baby potatoes and it turned out SO yummy. This will definitely be put into the cold weather meal rotation. Michelle! I’m so glad you found my site, and so happy that you liked my mustard spin on beef stew! And I like your baby potato addition – will try that here next time. I hope you come back often!